JTC celebrated its 50th anniversary in January of 2015. Ole Johannessen started his company as a steel import trading operation and after a few years added local inventory to be more responsive to immediate requirements of customers. In the early years inventories were kept in public warehouses in the Los Angeles Harbor area, which was quite common for a lot of companies in JTC’s line of business as cheap imports dominated on the West Coast, particularly in merchant bars and light structurals. 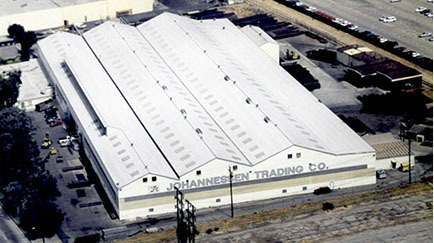 With the advent of domestic mini mills and therefore rail shipments from US mills were becoming a thing of the future, Johannessen Trading Company in 1984 moved into their current facility in the City of Commerce.